The signal lines are 10mil wide and the power lines are 16mil. I hand routed some of the power lines myself and then let Eagle’s much-maligned auto-router do the rest. After experimenting with some different placements and orientations of the ICs I managed to get the number of vias down to an acceptable number – too many vias is an indication that you may be able to make some improvements by repositioning the ICs. I use the prototype PCB manufacturing service offered by ITead Studio. If your board is double sided and comes in at under 50mm square then they will charge US$9.95 for 10 copies including delivery. Mine comes in at around 40x43mm so no problems there. ITead supply a DRC file that you can use to validate your design against their equipment. The finest trace/space they can handle is 6mil but in my opinion you’d be asking for manufacturing faults at that level so I try to stick to 10mil or higher. The only downside of ordering from China like this is that the delivery time to the UK is about 2 weeks. If you google around the internet you’ll find a few articles dedicated to explaining how you can hand-solder SMD parts. The method that I use is to pre-tin all the solder pads with a normal iron and then fix the parts by reflowing the solder with a hot air gun. I use regular solder (not paste) and smelly, messy but very effective rosin flux when working with the regular iron and no-clean liquid flux when working with the hot air gun. The secret to success here is to use an absolutely tiny amount of solder on each pad when tinning so the pad goes from flat to a tiny bump. If you create too much of a solder bump then multi-pin parts will not sit down evenly and you’ll have to manually fix them up afterwards with a fine-tip iron and a microscope. Although the hot air station makes working with SMD parts quite simple I think in future I’ll set a minimum size of 0805 for the discrete parts because 0603 is just too fiddly to work with. 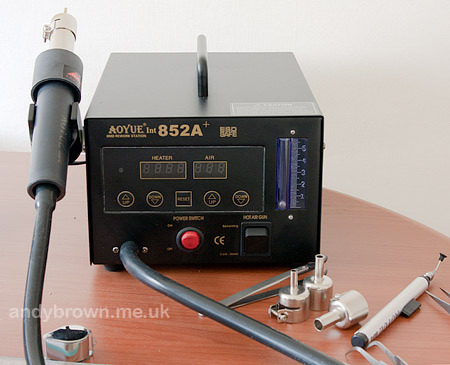 After soldering I inspect each joint with a 20x binocular (stereo) microscope and resolve any dry joints with the finest tip soldering iron that I have. 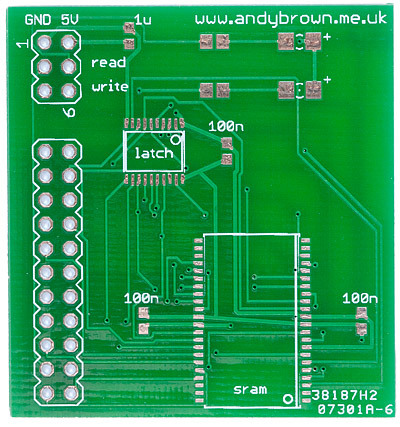 The finished PCB is designed to press directly into the Arduino Mega connectors without blocking off any more pins than it uses. Finally here’s a picture of the daughterboard attached to the Arduino Mega 1280. The GND and 5V supply pins are not connected in this image. I don’t have any more boards left to sell, but you can now print and build your own by downloading the package from my downloads page. Good luck! Would it be possible to put stackable pins on this board and use it with, for example, the Nokia 6300 LCD 'driver' board? Could things like the jpeg decompression be speeded up by doing this? Possible, yes. However if you were to want to use the xmem interface for both the LCD and the extended memory then you'd need to find an efficient way to control CS to choose between the two devices. You could possibly speed up the jpeg decoding by decompressing to an external SRAM buffer then moving chunks out to the LCD via the internal SRAM however I don't think the speedup would be that great. Can you also expand the memory in "Arduino Nano 3"? Hi, no you can't. The ATMega328 does not have the built-in xmem peripheral. Do you have by any chance have any boards left for sale? Hi, sorry I don't. However you can download the Gerbers from my downloads page and then upload them to ITead or Seeed and use their 5x5cm service to get 10 copies for about $10. I see that this is a 512K memory addition……but the part number you have listed now is a 4M SRAM. Am I missing something? Hi Rick, no you haven’t missed anything. Manufacturers list parts by the megabit. 512K x 8 bit = 4Megabit. Just curious. How did you get GND in the memory circuit? I don’t see a pin connection to GND. 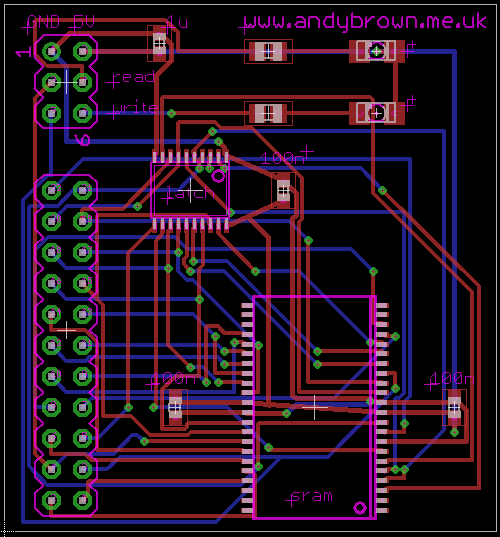 Hi, it’s pins 12 and 34 through vias and back to ground. 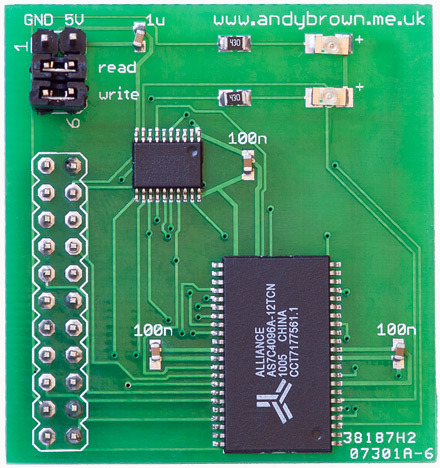 Yes, but the board you made is connected to the 5V side of the mega’s 2 x 18 connector. There are no ground connections on that side of the mega. The GND connections are on the other side of the 2 x 18 connector, or clear on the other side of the mega from the memory board. No modifications. 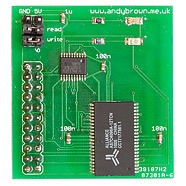 GND and 5V on the 0.1″ header are required to be connected to GND and 5V on the Arduino. If I were to do a v2 of this PCB then I’d source 5V from the top of the 2×18 block. It may even be possible to sink ground through an output pin set to low but I’d need to see what the structure of an MCU GPIO pin looks like before deciding if that should work or not.